May | 2018 | LIT.GAZ. There are times when I get cross with myself for not having read a book sooner: this one has been on my shelves waiting since 1995, and another reminder of it at my recent Shakespeare week finally convinced me to take it down and read it. It was published in the early 1960s when Kott, formerly critic and professor of literature and drama at Warsaw University had left for the West. A foreigner’s perspective on our national dramatist is always very interesting, and Kott’s was an eye-opener, coming from a man who had experienced (and initially supported!) Stalinism, as well as a man from a country with serious links with Shakespeare. It’s known, for instance, that in the 1590s when London theatres were closed because of the plague, Shakespeare’s company toured Europe, including Poland – it’s not known that Shakespeare was with them – and after the construction of the replica Globe Theatre in London, there was a major project, recently completed, to construct a replica theatre in Gdansk, on the Baltic coast, where any ship would have docked in the sixteenth century, and which hosts a Shakespeare festival of its own each summer. Kott offers first of all a convincing and unified vision of the History plays, with echoes and parallels in twentieth-century history. Then he considers the atmosphere of conspiracy and paranoia at state level in Hamlet. His analysis of the play, and particularly of the role of Fortinbras, is quite chilling and reflects the police states and secret police he knew so well, in this ‘drama of political crime’. This vision comes across strongly in Kozintsev’s stunning Russian film of the play from the same era. Kott sees characters devoid of free will and the ability to choose, and playing parts imposed on them by outside mechanisms. His approach, attitude and style of analysis are most definitely not English, and this is a collection of essays that could only have been written after the Second World War, and by someone who had lived under Stalinism; his is a very dark perspective on the world and on human beings. The essays on Macbeth and Othello I found particularly thought-provoking. Overall, his knowledge and understanding of Shakespeare and his relevance in the modern world is masterly, and his scope wide-ranging. There’s also a fascinating exploration of androgyny through the cross-dressing heroines of the comedies, Twelfth Night and As You Like It in particular, along with the subjects of the sonnets, strong and perceptive on the ambiguity, as well as considering the link between the need to use boy actors and the way Shakespeare framed his female roles. However, in some ways this section feels dated, particularly because of the old-fashioned, coded language when writing about homosexuality and homoeroticism in the early 1960s and from the background of a communist state… Approaches to Shakespeare generally have developed enormously in the intervening half-century, sparked by critics like Kott. The book concludes with an essay on The Tempest which sees parallels between Prospero and Leonardo da Vinci, and focuses on the circularity of the play which for Kott ends where it begins; it’s an essay which could not have been written pre-Hiroshima either. So, an eye-opener for me, a book to go back to, a book which I wish I’d read while I was still teaching, and a reminder not to let books sit on the shelves unopened. This book annoyed me; it felt like a lazy book, in need of decent editing. I’ve enjoyed travel writing by Paul Theroux in the past, but it has been about his travels in other countries than his own; here he travels through the Deep South of the US for a year, visiting and revisiting at different seasons of the year. He clearly feels deep affection for his country and this part of it, strives to know the region and its people and to understand it, strives to describe and report fairly about a region that has experienced many troubles. And yet, ultimately, I was rather bored. The book began badly for me, with Theroux mocking a good number of other writers who have made road trips around the US, attempting to show them up to be fakes or imposters who hadn’t travelled properly, who took short-cuts, who pretended to have done what they hadn’t. It’s very loosely written, rambling often: sketches, vignettes, cameos, all trying to build up an accretive picture of the Deep South. For a non-American reader, there were too many names and too much detail, and no map at all; perhaps some of the names and places may be familiar to an American reader, I don’t know. Perhaps one needs to be an American and to be familiar with the country to appreciate the book, in which case sorry, but the writer hasn’t done his job properly. The country comes across as quite scary in many ways; there’s the inevitable racism and violence, the gun shows, the details of events from the past. I was deeply shocked, even though I have read about it before, by the details of the abject and grinding poverty and third world conditions he describes in so many small towns in the richest and most powerful nation on the planet. Shocked, too, by the stories about US military nuclear facilities, which fit into the Chernobyl pattern in terms of carelessness, sloppiness, lack of care for people and the environment. If there were no god, no heaven, no afterlife, then, nevertheless there are still impulses in us (some of us?) that take us away from the purely material plane onto one which has been called spiritual, acknowledging an aspect of how our minds work. I say some of us, because I know there are people who do not seem to be bothered by thoughts of this kind, or else deal with them in a different way from me, and appear to get on quite happily with their lives… the world is surely large enough for all of us. But some of us do experience a need or a drive to make sense of it all. So for me, and others like me, religion is a way of addressing those spiritual impulses or leanings; for us there are very real issues that we engage with, that take us onto different levels of awareness or consciousness, that address our existential angst, I suppose. Then I turned my thoughts to a novel I’ve always rated highly, for lots of different reasons: A for Andromeda, by Ivan Yefremov. It’s a Soviet utopia, set a thousand or so years in the future after the inevitable triumph of socialism has transformed the whole planet, and humans are turned towards the cosmos and other worlds. No religion of any kind is mentioned; clearly it has died out under conditions of actually existing socialism, though it is referred to as an aspect of humankind’s primitive past. Yefremov nevertheless allows his characters to be awed by the beauty and wonder of the cosmos and the natural beauty of the world, too, in ways which today we might call spiritual. But he is the only SF writer I know to have imagined the end of religion. Olaf Stapledon‘s epic Last and First Men is different altogether. If humans cannot cope with the prospect of disappearance and individual annihilation, we are offered another picture, of our race evolving, mutating and moving to other planets in the solar system over geological time periods, during which we (?) become totally different species. And with a pang we realise that pretty early on in his imagined cycle, our particular humanity and its civilisations and achievements vanish, obliterated by the vastness of time and geological change, with absolutely no trace left behind…not just individual, but collective death. I’m not really sure where this has led me, sceptical about much religion and the miseries it has caused (though I don’t only blame religion for human misery) and yet, from my own upbringing inevitably drawn to the spiritual that I find in myself and others, and all around me. None of this balances the knowledge that I only have a tiny amount of time to enjoy what our world offers. I like to keep up with what’s going on in the world, and I’m increasingly concerned at the narrowing of what is on offer in conventional newspapers and other mass media. Radio news is increasingly trivialised, even on the BBC, and as for TV news, well… editors set an agenda but what it’s based on, one is never quite sure. So, given the time constraints, someone has selected quite drastically what we are going to be told. And I remember someone once calculated that if you took all the words actually spoken in a half-hour TV news bulletin and set them out on paper, they would fill the equivalent of a couple of columns of a broadsheet newspaper. Hardly very informative, then. So-called serious ewspapers in the UK have become increasingly focused on celebrity and lifestyle, which is cheap froth and fills pages, and also opinions on every subject under the sun written by the yard by people who know not very much about a subject. So newspaper now have several times the pagination they had three or four decades ago, but far less actual news. And if you think about the difference that getting your information from a website makes: it’s potentially a bottomless pit of links and clickbait: how do you actually know what’s there, compared with being able to turn over the pages of a physical newspaper and glance at ALL the headlines? Our newspapers also – perhaps inevitably, but also because it’s easy – focus on the anglophone world. We’re an island, and even though we’re only twenty miles off the coast of Europe, news of that continent impinges relatively little. Where is one to turn for reliable and in-depth information? I cast my net quite widely. I keep an eye on the New York Times and the Washington Post online, and Le Monde as a window on Europe. There’s a weekly digest from Der Spiegel in English which is often quite interesting, picking up on things I’d never otherwise come across, or offering a different take on matters from the British press. I’ve kept up with the London Review of Books and the New York Review of Books as they both offer very detailed and lengthy comment and analysis of topical issues, sometimes linked to newly-published books, sometimes just because the topic is of moment. My main go-to for its breadth and scope of coverage of world issues, from a left-wing perspective, with an environmental slant and a recognition of the entire world rather than just parts of it, for the last 20 years or so has been the French monthly Le Monde Diplomatique. Despite its title, it’s not written for diplomats or about diplomacy! It is published in numerous languages including English, and seems to me to offer a comprehensive coverage that I’ve so far not found anywhere else, and I judge that it has kept me informed about aspects of world politics, society and the environment that I’ve rarely seen covered in our press. Is Shakespeare that good? How good is he? I’ve recently come back from my annual week with a group of a couple of dozen like-minded folk where we’ve sat and studied and explored Shakespeare and been to Stratford to see a couple of his plays at the RSC – Romeo & Juliet and Macbeth this year. The first performance was not bad, the second was brilliant. And at some point we find ourselves sitting in a room all saying in different ways how wonderful Shakespeare was… and sometimes I find myself feeling uneasy. Can we step back and judge the man objectively any more, or has he been canonised in such a way that it’s impossible to be critical? Or is he clearly brilliant every which way and that’s that? His language is wonderful: it’s hard to challenge that, particularly in his plays. I was particularly aware of this first re-reading and then watching Macbeth in performance. But when I’m reading or listening to his sonnets, wonderful as they are, I’m always reminded of his contemporary John Donne, whose poetry I’ve always preferred, who breaks out of the restricted and constraining sonnet form when he feels like it (quite often), who often writes as he would speak, with great power and freshness, contrasted with which Shakespeare can seem a bit trite, and same-y – all those sonnets! But when I read or see plays, yes Marlowe occasionally matches Shakespeare’s language in range and scope, as does Webster too, at times… but Shakespeare just does it so well, so consistently, so effortlessly, time and again. Many people pay tribute to the way Shakespeare contributed to the development of our language, his coining of new words to suit divers occasions and situations; it’s true. But so did Milton, just as much and as powerfully, but people don’t read Paradise Lost any more, and so they never see or hear Shakespeare’s equal in this field. We are fortunate that so much of Shakespeare’s oeuvre has survived – a couple of plays are known to be missing – and perhaps many plays by rivals did not. Shakespeare wrote in all the genres – historical plays, comedies, tragedies and romances, so there is a breadth to his work we do not have in his rivals. His themes are the same as those used by everyone else, and the judgement seems to be that he just outdid the rest. Shakespeare is ‘for all time’, said friend and rival Ben Jonson. This may well mean the subject-matter of his plays and how he develops his ideas and characters. Writers are always going to write about the same issues – love, hate, jealousy, rivalry, death, ambition, friendship… but does Shakespeare inevitably have the last or the best word on all these topics? Maybe he enjoys an advantage as a dramatist, in that he brings it all to life, in front of us onstage: there is an immediacy and an intensity that few novelists are able to achieve in what is a totally different literary form. It’s taken me a very long time to realise that I’m a writer. I spent years training students and teaching them the craft of writing, how to organise their ideas, how to choose their words carefully, how to spell and punctuate correctly to enhance communication, that I lost sight of the fact that I write too. I’ve written this blog for more than five years now and WordPress informs me I’ve written the equivalent of several novels’ worth of posts… I’ve written a couple of literature study guides and am completing a third. I used to review science fiction for an academic journal, and I used to write for the students’ union newspaper when I was at university. And I’ve written countless essays, a dissertation and a thesis… all a very long time ago. What I’ve never done, at least not since I was at school, is write creatively, write a story or a descriptive piece. I’ve no desire to write poetry, it’s not something I aspire to, but lately I have started to wonder about trying to be creative and where I might start if I did pluck up the courage to dip my toe in the water. There are creative writing groups out there, but then I’d have to expose myself to others’ gaze, and I’m not sure I’m ready for that… How do I make a start, and how do I decide whether it’s worth it? I’ve been blogging seriously for over five years now, so I step back to take stock of what I’ve been up to and what I’ve actually achieved. Nearly seven hundred posts, enough words written for several novels. Posts about individual books, novels, plays and poems. Posts on more general topics, to do with aspects of literature and teaching. Posts about my travels, about the Great War, and lots more besides. I write each piece using my notes, revise it carefully, and look for a picture of the book’s cover to illustrate it, if the post is about a particular book. I haven’t had that many comments on what I’ve written, and sometimes this saddens me; I wonder if it’s because I come across as too knowledgeable, or my reading and thoughts are too obscure, or the way I express my opinions tends to preclude comment or discussion. I’ve long wanted to engage in dialogue with more of my readers; I’m grateful for the comments that do develop into an exchange, and I like it when people disagree with me, take issue and argue – I think my former students would back me up here… Anyway, to those of you who do comment, whether to agree, disagree, or offer a different perspective on what I’ve said – thank you. It can be done, however: I went to this performance with two first-rate productions in mind that I had seen over the years, an excellent one at the West Yorkshire Playhouse a good many years ago now, where the entire stage was centred on a gigantic double bed, and an equally good and more intimate production at the Royal Exchange in Manchester. The RSC didn’t come up to either. There were interesting touches. Sometimes gender-role changes are gratuitous, but here the female Mercutio managed the difficult task of making the Queen Mab speech work well, although she wasn’t consistently good throughout. Benvolio and Capulet were good: for me the touchstone is how Capulet carries off the scene where he loses his temper after Juliet has declined to marry Paris, and here he was superb. For most of the group, though, it was the outstanding performance of the Nurse – a role that can be really tiresome if played wrong – that won the day. Re-reading the play before the performance, for the first time in a number of years, I was struck particularly by the density of the language, and its stunning poetry. Yes, I’d been aware of it, but it’s not possible to make too much of it teaching to teenagers, and so I suppose I had backgrounded it. The performance was stunning and I was gripped from the start and throughout. Christopher Ecclestone played Macbeth brilliantly, and there was a real sense of rapport between Macbeth and Lady Macbeth, which there absolutely must be for the play to hold you, since it lacks any other strong characters, and the degeneration of the relationship over time was evident, as was the sense of Macbeth gradually losing interest in life and everything he had won through association with the powers of evil. It was a modern dress production, and this did not intrude on my appreciation. The weird sisters were played by children, young girls in pyjamas holding dolls, and this was a very effective approach. I’ve always felt that the witches are very difficult to do convincingly for a modern audience, and the over-playing of wizened hags with daft voices dancing around cauldrons has always left me cold. Here, there was simply mist, a slight edginess to the girls’ voices through some technical trick, and a spookiness through the use of dolls: the whole trope of children and childlessness that permeates the play was thus foregrounded. Another enhancement, or directorial decision, if you like, involved the development of the role of the porter, who was dressed like a school caretaker, and who, after his speech – another that is difficult to pull of well – lurked sinisterly at the side of the stage for the rest of the play, almost a chorus figure, doing various small things that commented or reinforced the action of the drama, at times appearing almost Brechtian. The banquet scene worked well, the long table used effectively for a number of scenes, and even the dreary scene between Malcolm and Macduff in England was given a pace and focus that made it work. Macduff receiving the news of the deaths of his family was a very powerful tragic moment. Macbeth is a relatively short play, and the pace and coherence of the production made it powerful and effective, and I left the theatre glad that I had finally seen a performance worth seeing and that had done justice to the play. 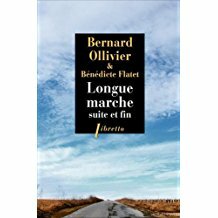 I was fascinated by Bernard Ollivier‘s account of his three-year endeavour to walk the 12,000kms of the Silk Route, from Istanbul to Beijing, a project he undertook around the turn of the century, after he had retired, and lost his wife. It wasn’t exploration, but it was genuine travel, as he engaged with all sorts of people he met on his journey, and grappled with many problems. There are three volumes in his account (1,2,3). He is less rigid about scrupulously covering every kilometre on foot this time; there are occasional short bus and taxi journeys when these are necessary to avoid difficulties. He is older and more crook than previously and he lets us know this. Encounters with locals in places they pass through are markedly more difficult and rarer when there are two of them, though people still do marvel at the craziness of the exploit when they learn what the couple’s goal is. It’s Europe, so feels more familiar than the earlier walking, but for me the real eye-opener was his account of their journey through the Balkans. He passes through all the countries that were rent by the horrific civil wars and massacres in the years around the turn of the century, conflicts that we lived through and heard about at the time and were appalled by, but which, of course, we have now more or less forgotten. Their impressions of the aftermath of the war: the destruction still apparent; the cemeteries which dot the landscape as those of the Somme battlefields do; the suspicions and latent hatreds still smouldering between communities and nations, the issues unresolved; the footpaths they cannot walk along because of the uncleared mines… it was a chilling picture, presented through the eyes of a couple with whom I could identify because of their ages and their love of walking and encountering people.